A defining characteristic of Heroes of the Storm the developer Blizzard loves to highlight is the fact that average match lengths are much shorter than those in Dota 2 and League of Legends. While that’s still the case, data compiled by dedicated fans suggests HOTS game times are gradually increasing. Previously, Blizzard has told Kotaku and many other sources that the majority of Heroes of the Storm games run under 20 minutes. 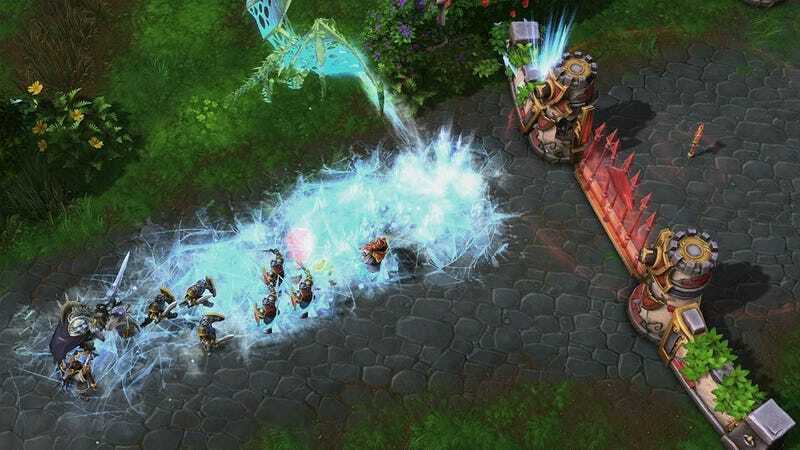 yutinxiang surmises that the jump in game length is a result of Blizzard improving the quality of matchmaking in HOTS, which leads to closer, and therefore longer, games. This analysis certainly reflects my own experience, and that of the friends and fellow HOTS players I regularly team up with. Matchmaking has definitely gotten a lot better since I started playing Heroes this spring when it was still in closed beta, which has lead to teams that are both better balanced experience and skill-level wise (which is more important for ranked Hero League games) and team composition-wise (more important for Quick Match games). Back when I started playing, I’d often get grouped into QMs with a team of, say, all assassins, healers, or tanks, which made for many games where my team was either stomped out of existence very quickly...or maybe we were the ones doing the stomping. Hotslog data should be qualified by the fact that some of it can be slightly out-of-date, particularly when it comes to individual player data, since players need to upload their replays manually. If anything, though, I would think that the statistical limitations of the fansites lead to this curious development being under-emphasized. Looking over my recent match history from the past few weeks, I see many games that last over 25 or 30 minutes. Games this long were a rare sight when I first began playing. A Blizzard representative wasn’t immediately available to comment on Heroes game length or the Hotslogs data. Now: Is cracking 20 minutes a hugely important shift? No, at least not yet. HOTS games are still much more briskly paced than Dota 2 and League of Legends games, which does indeed add to the game’s casual-friendly vibe that Blizzard wants to promote for its work. We also shouldn’t take longer games as a bad thing for HOTS. If anything, the early matches I played felt too short sometimes. Having more time means that you and your teammates have more room to breath, relax, and enjoy themselves rather than obsessing over the first five minutes of a match as if automatically determine the course of the rest of the game. Also closer matches mean that there’s even more room for awesome comebacks, which is something that many players (myself included) love about Heroes. At the same time (har har har), Heroes of the Storm only left beta at the beginning of the summer. If game length continues to climb the way it has since its official launch, the developer will likely need to account for it in some way—if it wants to maintain its reputation at the quick-and-easy MOBA.